By an extraordinary coincidence, the gravestones of Jeffery Sackett and his family at St Mary's Church, Sandwich, were "discovered" twice in one afternoon by Sackett Family Association members attending the reunion in Thanet, Kent, last September. Jean Carpenter and her brother Mike Trickey can claim the first sighting, and this was followed an hour or so later by Steve and Debbie Barbee, accompanied by Chris Sackett. 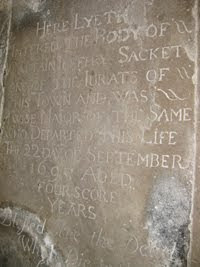 Jeffery Sackett, 1617-1695, was three times Mayor of Sandwich. His biographical sketch includes details of his father's will—he was effectively disinherited by his father—and of a lengthy case in the Chancery Court which Marion Sackett had researched some years ago. The court case, a sorry tale of greed and marital disharmony from which our man does not emerge well, is a sad reminder that human nature is not much changed down the ages. Mike Sackett and Mary Volberding recently visited Sackets Harbor where they toured the Sacket Mansion and met local historian, Bob Brennan. Their visit attracted the attention of the local press and an article appears on NewsWatch. 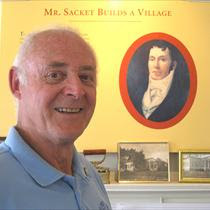 Checking up in the Sackett database reveals that Augustus Sacket, who founded Sackets Harbor, was Mike's sixth cousin, five times removed—a detail that evidently did not come readily to mind during the interview!